The following is a list of general guidelines, for questions on conditions specific to your project please contact us directly. Wetland Sod mat delivery should be scheduled to coincide with immediate job site installation. If mats cannot be immediately installed, they can be stored in a shady location for no more than three days and must be kept thoroughly saturated and covered (tarped) during that time. In hot, dry weather mats should be stored under the same conditions for no more than two days. Mats are delivered rolled and are most easily moved by two people with hay hooks. NFNP does not use pallets to ship Wetland Sod. 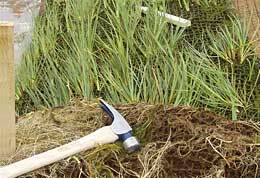 Each Wetland Sod mat is approximately 16.2 feet in length and 3.2 feet wide. Per mat weights vary seasonally between 120 - 170 pounds. Each mat is banded with a species classification tag for identification. For example, a mix with Carex nebrascensis, Carex aquatilis and Juncus arcticus will read CnCaJa. Mats are simply moved to the installation site, unrolled and then staked down. Ensure that the plant roots and the bottom of the mat are in direct contact with the soil. Space between the mat bottom and ground caused by folds, wrinkles or upturned mat edges will create a void that will allow the root system to dry out. Installing mats over large rocks, tree branches, very rough ground or anything that prevents root-to-soil contact should be avoided or remedied prior to installation. Mats should not be installed on slopes steeper than 2.5:1. Some die-back can be expected when slopes exceed 3:1 steepness. Drive stakes through the mat at a slight angle and leave about 4” of the stake protruding above the mat. Use eight to twelve, 16” wooden stakes per mat for installations involving moving water (i.e. stream channels, windward lake shores, storm water retention areas). Use six to eight, 16” wooden stakes per mat for site conditions without erosive characteristics (i.e. pond and lake shorelines, wetland areas). Ideally, mats should be installed in water depths of 2 to 4 inches. If site hydrology at the time of installation is lacking, plants will need supplemental irrigation. Additional irrigation will need to be provided during the first 3-4 weeks in order to ensure plant root establishment in surrounding soils. Conversely, if water levels are too deep at installation or during the first month after installation, the plants can die. After roots are well established, plants can tolerate periodic hydrologic famine or deeper water conditions. 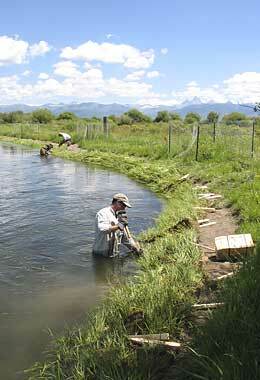 On stream banks we recommend Wetland Sod installation just after peak flows, when water levels are gradually dropping. Supplemental irrigation may be required to fully establish the vegetation, but it will generally be fully rooted and ready for high water the following spring. The time required for roots to provide adequate anchoring depends on growing conditions including heat, light, and moisture. NFNP does not provide installation services. We have, however, compiled data from various clients to provide some guidelines with respect to anticipated installation times. Based on that data, average installation time per mat is approximately .40 labor hours (24 minutes). This figure includes time for unloading, handling, on site distribution, and installation. Of course this is an average, installation times and labor requirements can vary significantly from site-to-site depending primarily on site accessibility. Use of a 4-wheeler or utility vehicle is not required but may make handling easier and installation faster depending upon site conditions.